​Embodying Earth: A Moving "Council of All Beings"
In a time in which we are constantly reminded by the news or by changes in our own backyards of the intense ecological devastation affecting our planet, many of us might feel overwhelmed by grief, despair, anger, or apathy. From these understandable and natural reactions, how can we connect with the empathy, compassion, hope, and energy that help us take the needed steps toward embodied action and positive change? In this workshop, we will explore the approach of deep ecology and ecopsychology, inspired by Joanna Macy’s “The Work That Reconnects,” and the meditative form of “Authentic Movement.” Tapping into levels of consciousness beyond human, we will listen to, embody, and express (through movement, words, and visual art) the wisdom of the natural world in a “Council of all Beings.” Please come in comfortable clothes that you can move in. Poet, mother, dancer, herbalist, teacher, and story-teller, Lydia Russell weaves ways for people to remember that they are part of the earth. 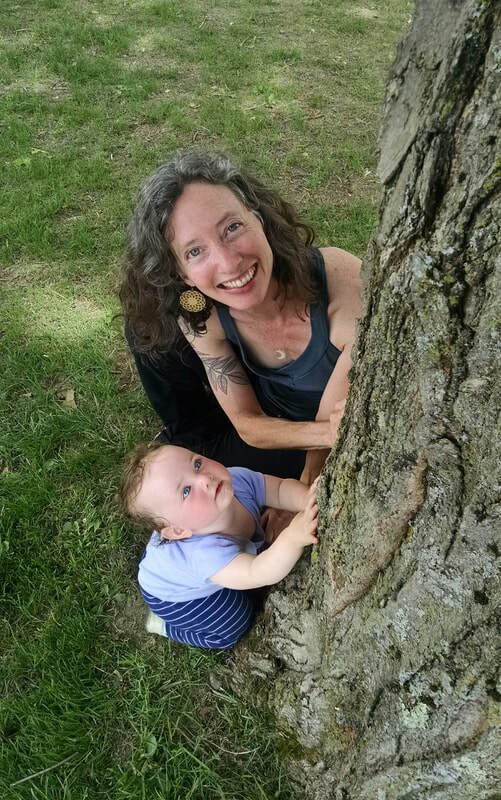 A disillusioned yoga teacher, former environmental educator, current student of counseling and psychology, and practitioner of Authentic Movement, Lydia is committed to social justice, art and activism, critical yet compassionate thinking, and long walks in the woods. Amanda Franz is an embodiment activist, movement artist and lover of all things wild. She is on a crusade to invite people into the profound intelligence of their bodies and reconnect all bodies to what’s alive, what it’s like to be a human-animal and how to bring this work into the Great Turning. Her personal areas of inquiry and training are contact improvisation, Butoh, Axis Syllabus, Authentic Movement, Body Mind Centering, Somatic Experiencing and Joanna Macy’s- “The Work that Reconnects”. Amanda currently co-creates THE EVERYTHING SPACE- a somatic education studio weaving together personal growth and dynamic social change, where she runs a private practice in somatic bodywork and movement education, teaches a slew of workshops and classes, consults with organizations for wellness workshops and somatic implementation and hosts her herbal business Wild Things Herbal Apothecary. Learn more here.